A National Climate Assessment reported that climate change will lead to more prevalent drought and increased temperatures throughout the upcoming century. However, the assessment also reported that climate change will lead to more extreme storms and warmer nights. The agriculture industry will soon face more frequent extreme weather and more tenacious pests, according to a White House assessment. If farmers cannot overcome these challenges, then U.S. crop and farm profits will decline, the assessment warned. Read also: "Climate change threatens U.S. food security; crop insurance poised to remain hot topic"
“It’s really gotten to the point where the new normal is extreme weather," said Brad Rippey, a U.S. Department of Agriculture meteorologist. "And that is certainly true for the Midwest and the Great Plains, two of the big production areas for the United States." The White House released the 1,300-page National Climate Assessment earlier this month as part of President Barack Obama’s Climate Action Plan. One agriculture-related consequence of climate change will be violent storms, the assessment forecast. Data show that the number of days with heavy rainfall has increased in Iowa. According to the National Climate Assessment, other regions will see similar increases throughout the remainder of the century. Unwelcome heavy rains can drown crops, dilute nutrients and erode soil. Heavy rains can also delay spring planting. “By midcentury, when temperature increases are projected to be between 1.8 [degrees Fahrenheit] and 5.4 [degrees Fahrenheit] and precipitation extremes are further intensified, yields of major U.S. crops and farm profits are expected to decline,” the assessment stated. 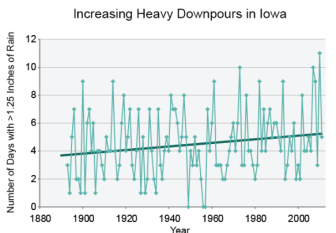 A review of precipitation data from the Iowa Department of Natural Resources shows that the number of heavy downpours in the top corn producing state has increased since the early 1900s. Since then, that average has grown to about six days each year. “It seems that on a flip of a dime you can go from drought to flood and back again,” said Rippey. 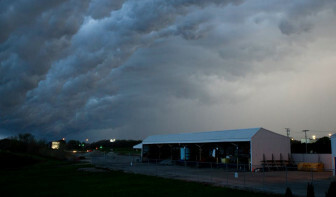 A storm moves across the horizon in Savoy, Ill. "It’s really gotten to the point where the new normal is extreme weather," said Brad Rippey, a U.S. Department of Agriculture meteorologist. Doug Yoder is the senior director of affiliate and risk management for the Illinois Farm Bureau. He said he does not necessarily agree with climate studies, but explained that farmers can prevent some heavy rainfall problems by planting cover crops, which protect and enrich soil. Examples of cover crops include crimson clover and cereal rye. Earlier this month, the White House released the 1,300-page National Climate Assessment as part of the president’s climate action plan. As Robert Holly reports, climate change may soon be affecting our food and farms. The National Climate Assessment cautioned that farmers will have to overcome hotter nighttime and offseason temperatures, as well. 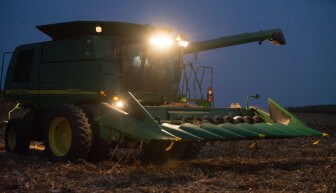 Warmer nighttime temperatures could weaken the agriculture industry by producing inefficient crops, the assessment reported. Though plants grow faster in warmer temperatures, they become exhausted without a chance to cool down at night. Crops exposed to high nighttime temperatures yield less and at lower qualities. Warm nighttime temperatures diminished yields throughout the Midwest in 2010 and 2012. Brad Rippey, a meteorologist for the U.S. Department of Agriculture, said warm nighttime temperatures can even cause more crop damage than drought. High nighttime temperatures affected corn yields in 2010 and 2012 across the Corn Belt, according to the assessment. The number of hot nights will increase by as much as 30 percent in coming years, the assessment concluded. Similarly, perennial crops, such as cherries and plums, have chilling requirements from 200 to 2,000 hours over the winter. 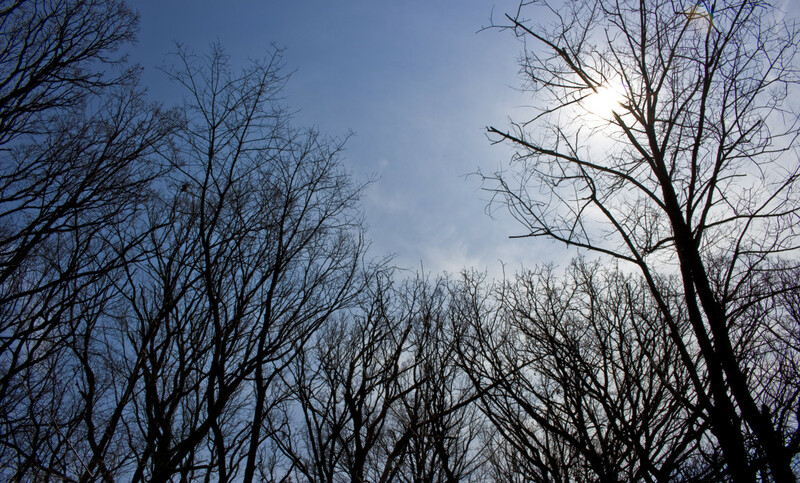 During that period, the crop becomes dormant and stops growing, saving its energy to bud come spring. If the chilling requirement is not met, yields decline. Federal crop insurance data show that California cherry and plum farmers received a total of $4.1 million in 2000. In 2012, they received more than $25 million. Climate projections estimate that fruit and nut trees will not meet their regular chilling requirements by some point within this century. 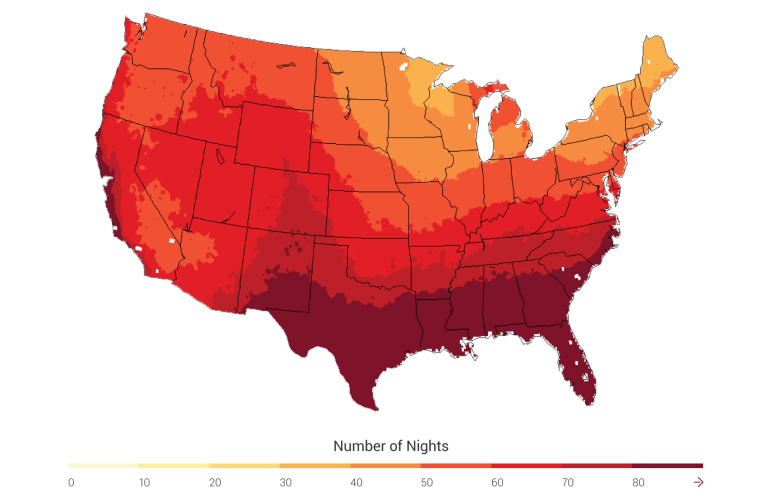 U.S. nighttime temperatures will increase throughout the remainder of the century, according to the National Climate Assessment. Too many warm nights negatively affect crop production because plants need nightly cool-down periods from growing. If nights are warm, plants continue growing and become stressed. The above map shows projected changes in nighttime temperatures for 2070-2099 compared to 1971-2000. The National Climate Assessment also warned that climate change will create ideal conditions for weeds and insects. “Weeds, insects and diseases already have large negative impacts on agricultural production, and climate change has the potential to increase these impacts,” stated the assessment, which listed weeds as the greatest cause of global crop loss. Economic Research Service data show that farmers used more than 877 million pounds of pesticide in 2007. Purchasing and applying that pesticide cost them about $7.9 billion. Read also: "New report criticizes EPA pesticide registration process"
Pesticides and the cost to apply them will increase as temperatures and carbon dioxide levels rise. In turn, higher chemical concentrations and frequent spraying may cause environmental problems. Privet and kudzu illustrate how climate change also causes weeds to migrate into once cool regions. The two types of weeds are widespread in the southern United States and are making their way north. The USDA plans on finishing the study before the end of next year. The assessment ranked insects as the second-leading cause of global crop failure and another major problem when it comes to climate change. 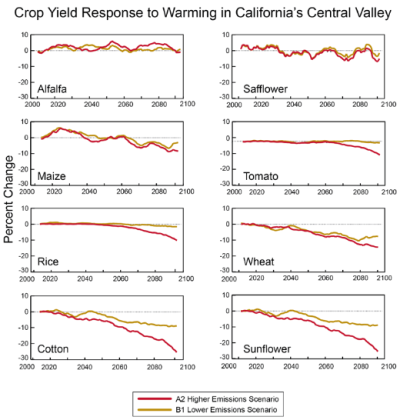 The above graphic shows projected yields for eight crops grown in the Central Valley of California. Projections are for two emissions scenarios, one in which gas emissions are reduced and one in which emissions continue to grow. Insects are dormant during cold periods and active during warm periods. They reproduce when temperatures reach seasonal highs. Hotter summers will mean increased reproduction time. In some cases, the warmer summer temperatures will also lead to different generations of insects in a single year. An example of this already exists with the European corn borer. The insect produces one generation in the northern Corn Belt, but more than two generations in the southern Corn Belt. Warmer winters will also mean a smaller window of cold to kill off those insects, too. The assessment suggested that a growing global population will magnify many of the problems stemming from pests and extreme weather. Projections from the United Nations Population Division estimate that the world’s population will grow to more than nine billion people by 2050. Researchers from Iowa State University, Arizona State University, the Pacific Northwest National Laboratory and the USDA contributed to the assessment.